kindakooky: Om Ah Hung ! I awoke this morning at 5:55 am to attend an early morning meditation with Khandro Thrinlay Choden. Khandro is a female Tibetan Buddhist teacher who is an inspiration. As well as travelling the world sharing her knowledge, which is a great blessing to us all, she oversees a number of projects in India which include Himalayan Hermitages for Women, providing medical services for the Himalayan nomads and providing educational grants to young people who are from isolated and poor families. Khandro la is currently in Australia and will give be giving teachings around the country. She has such a warm and loving nature. 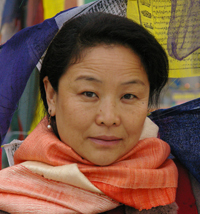 To find out more about Khandro and her projects please check out http://www.khachodling.org/. My friend Jane is fortunate to travel with Khandro la as her attendant. I am so happy to have her back in Australia. I met Jane years ago when I went to Sakya Tharpa Ling while on a journey to find out more information about Tibetan Buddhism. I had read the Tibetan Book of Living and Dying by Sogyal Rinpoche and was looking for more.